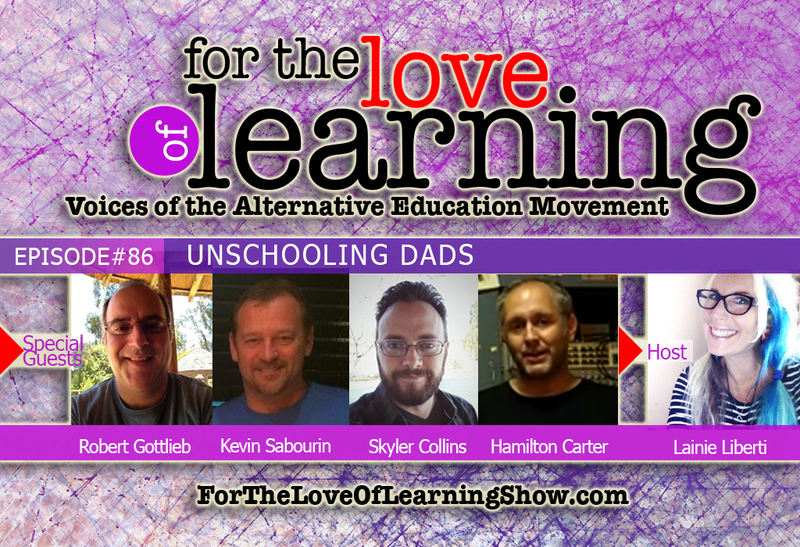 In tonight’s episode we’ll explore unschooling with 4 unschooling dads. We’ve done shows in the past about unschooling, but tonight’s episode, we’ll explore unschooling from the father’s perspective. What does it mean to be a father in an unschooling family? Do stay at home dads experience unschooling differently than those that work outside of the house? 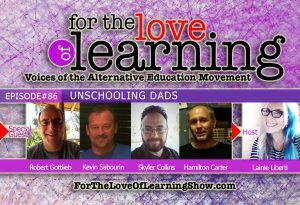 How do unschooling dads break free from the traditional roles and expectations society has placed on them? What unique set of challenges do unschooling dads face? The men on tonight’s panel will answer these questions and more. Robert is a software developer by day for the US federal government, and by night he’s father and best friend to Rhiannon (10) and Alex (18), and hubby to Corinne. He’s a foodie and a technoweenie. He’s a Mac enthusiast and love to tinker with Operating Systems and Programming Languages (yes a self proclaimed geek). He also loves to learn new things all the time. That’s probably how he came to understand unschooling and introduce it to his wife. Hamilton Carter’s childhood dreams of becoming an archeologist/novelist/physicist/adventurer morphed into his present-day life as a dad/science writer/post-physics grad student/electronics engineer, which is to say he’s accomplished all his life goals to date. As a kid, his love of comic books and sci-fi led him to science. He built a cyclotron in high school while hanging out with classmates who built linacs, Tesla coils, and linacs powered by Tesla coils. Having grown up in the mountains of south-central New Mexico, he enjoys hiking and camping with his family anytime he gets anywhere near a mountain. Not long after having his third kid, Hamilton found out he’d been unschooled without his knowledge. Now, having fully embraced his latent unschooliness, the whole family’s having fun with the philosophy roaming their San Francisco environs, and making friends. Skyler J. Collins lives with his beautiful wife and three wonderful children in Salt Lake City, Utah. He’s a voluntaryist and radical unschooler. He enjoys reading, writing, and podcasting about anything on liberty, economics, philosophy, religion, science, health, and childhood development. He and his wife are committed to raising their children in peace and love, exploring the world with them, and showing them how to deal with others respectfully, and enjoy their freedom responsibly. He is the founder of Everything-Voluntary.com, a website dedicated to promoting several philosophies consistent with the voluntary principle, that all human relations should happen voluntarily, or not at all. These philosophies cover politics, economics, education, and parenting.